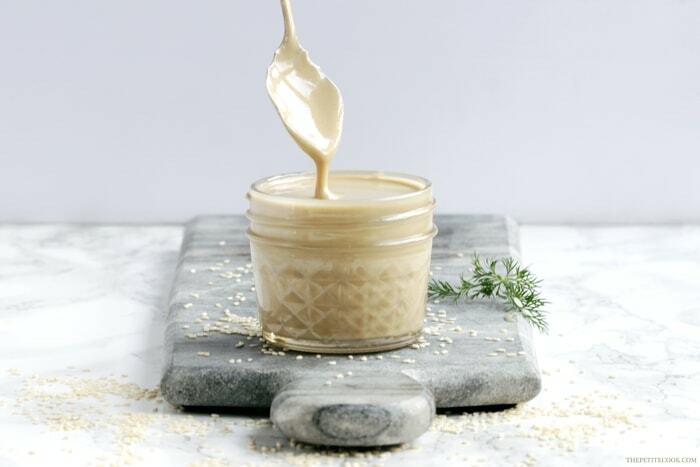 Making your own homemade tahini sauce is easier than you think – You need only 2 ingredients to make a delicious sauce that will instantly upgrade all your healthy recipes. Tahini is a traditional middle eastern thick sauce made from ground toasted sesame seeds. It’s one of the main ingredient in traditional recipes such as hummus, baba ganoush or halva. It’s no secret I’m a big fan of nut-based spreads and sauces. Whilst peanut butter never got a special place in my heart, I’ve been recently addicted to almond butter, and we’re never short at home of homemade nutella. 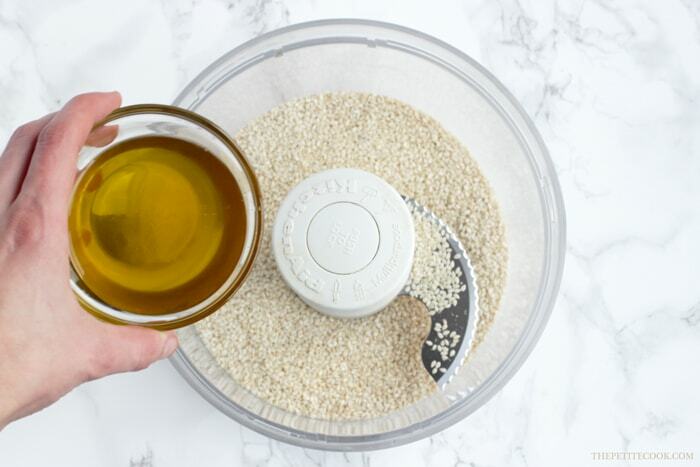 Tahini is just one of my latest favorite ingredients to use when making dressing for healthy salads. Every now and then, I also love to add a tbsp or 2 into these brownies or these muffins. Tahini add instant deep nutty flavor to almost anything, it’s incredibly easy and quick to make and lasts for a long time. The only equipment you really need to make it, is a good food processor and you’re ready to go! Making your own homemade Tahini couldn’t be easier. This recipe takes about 10 mins and requires just 2 ingredients: sesame seeds and a light cooking oil. I usually add a mix of light olive oil and sesame oil for extra flavor and silky texture, but feel free to leave the second out. 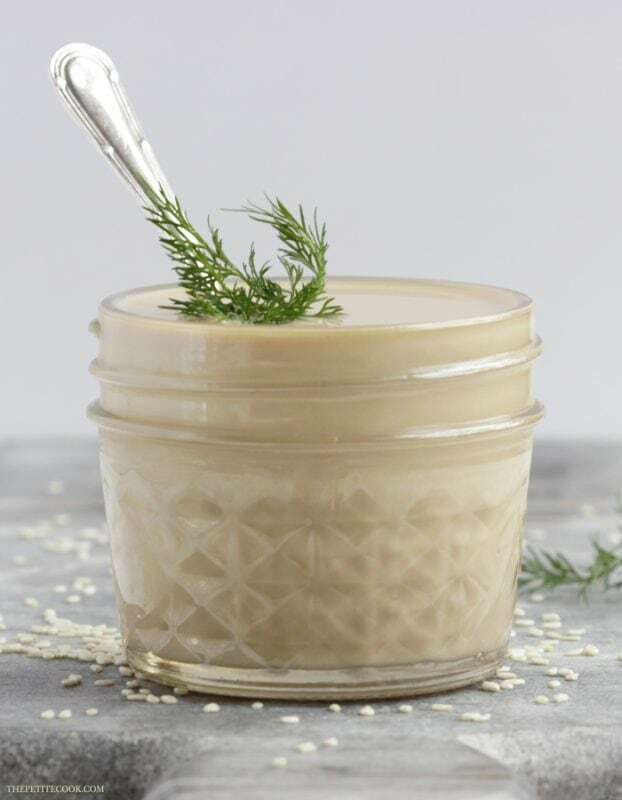 I like to use toasted sesame seeds when making my homemade Tahini, it gives a deep nutty flavor that makes me love it even more. You can either toast them on a grilling pan for a few minutes or place on a baking sheet and bake them for 5 mins at 180C/360F until golden. Then all you have to do is add the sesame seeds in your food processor and pulse until creamy. Fold in some sea salt flakes and slowly pour in a little olive/sesame oil if you like. Scrape down the edges every now and then if necessary. Patience is the key when blending the sesame seeds, Tahini can take a bit to come together. Eventually, it will turn into a smooth creamy sauce, ready to upgrade any healthy dish from traditional hummus, to delicious dressings for salads and falafels. I hope you give this incredible recipe a try! If you do, please leave a comment below and let me know how you liked it! Or even better, take a picture, tag it #thepetitecook and share it on Instagram! Looking at your yummy creations always makes my day :)! 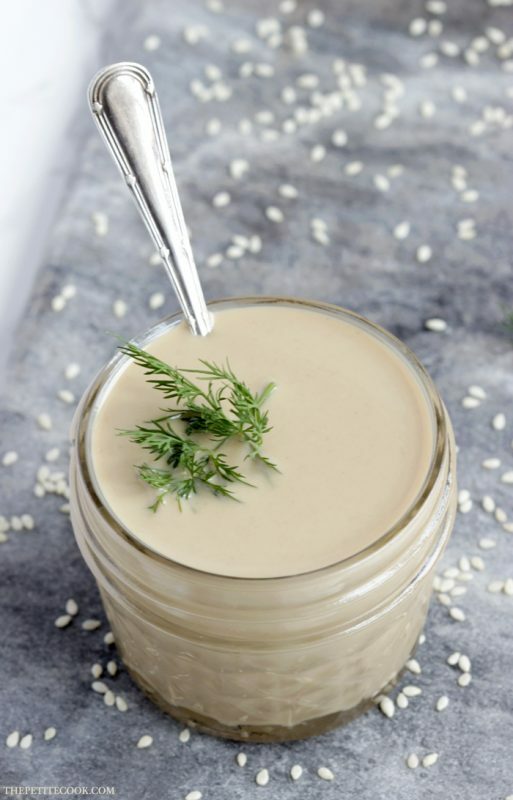 Making your own homemade tahini sauce is easier than you think - You need only 2 ingredients to make a delicious sauce that will instantly upgrade all your healthy recipes. Optional: Toast sesame seeds in a grilling pan over medium-low heat, stirring constantly until the seeds are golden and fragrant. Alternatively bake in the oven at 360F/180C, until golden, about 5 mins. 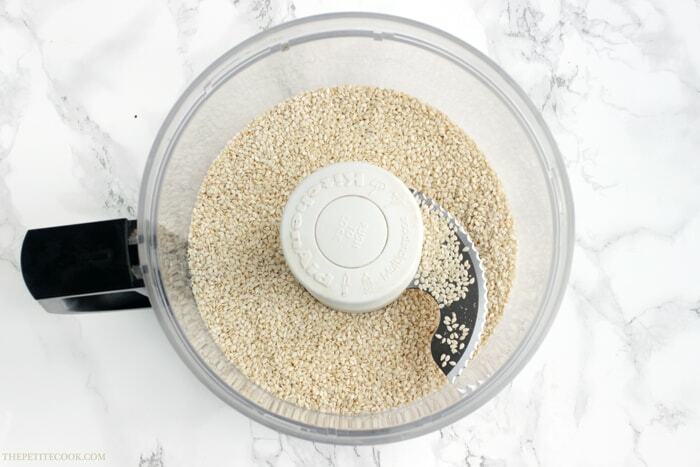 Add sesame seeds into a food processor then process for a min, or until crumbly. Add a little salt and oil, and pulse for a couple more mins, scraping the bottom and sides of the food processor a couple times. Keep pulsing all the ingredients until you reach a smooth, creamy consistency. Add a little more oil if necessary. Store tahini in an airtight container in the refrigerator for one month. Will this work in the food processor without the oil? Thanks!